The inaugural ASEAN+3 Financial Forum (ATFF) 2016 was attended by high-level policy makers, renowned academics and economists who have strong background and experience on the East Asia region. 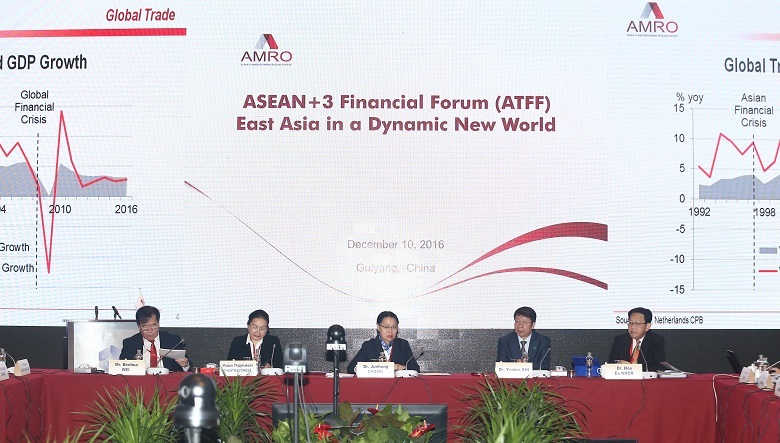 GUIYANG, CHINA, December 10, 2016 – ASEAN+3 Macroeconomic Research Office (AMRO) today held the inaugural ASEAN+3 Financial Forum (ATFF), back to back with the ASEAN+3 Finance and Central Bank Deputies’ Meeting (AFCDM+3) in Guiyang, China. 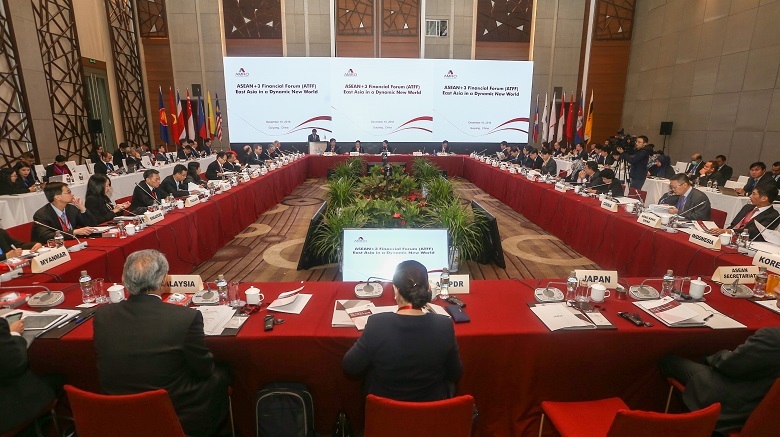 With the theme of East Asia in a Dynamic New World, the half-day forum focused on the regional outlook and policy responses and regional financial cooperation against the backdrop of an uncertain external environment. The forum was attended by Dr Yaobin Shi, Vice Minister of the Ministry of Finance, China and Madam Thipphakone Chanthavongsa, Vice Minister of the Ministry of Finance, Lao PDR, Co-chairs of ASEAN+3 for 2016. Discussants and speakers include high-level policy makers, renowned academics and economists who have strong background and experience on the East Asia region. The panelists noted that East Asia continued to be a bright spot in the global economy, thanks to earlier reforms and structural adjustments that economies in the region have undertaken. Growing intra-regional linkages in trade and investment within the region have also helped to bolster regional growth, at a time of weak external demand from outside the region. Going into 2017, the external environment is even more challenging, with tightening global monetary conditions, policy uncertainty from the incoming U.S. administration and Brexit negotiations, and the rising risk of trade protectionism. The panelists discussed the tail risks for emerging markets, including capital outflows, currency depreciation and trade tensions. In that context, policy makers are advised to deploy the full suite of policy tools to deal with potential external risks, including appropriate monetary and fiscal policy settings to support growth while maintaining financial stability, and structural policies to lift the long-term growth potential of the economy. Against the current backdrop of uncertainty in the external environment, strengthening regional financial cooperation can be beneficial to all economies in the region. 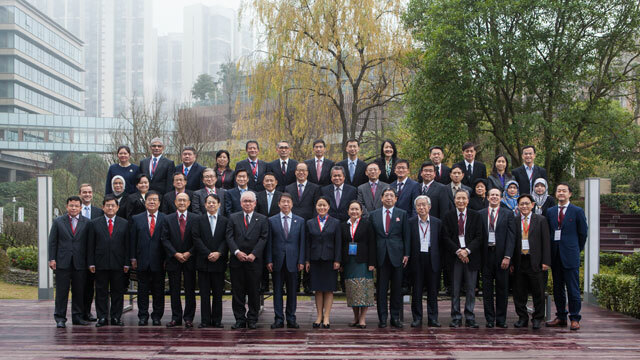 AMRO senior management team, Finance and Central Bank Deputies and distinguished speakers and participants at the inaugural ASEAN+3 Financial Forum (ATFF) on December 10, 2016 in Guiyang, China. The forum also discussed new opportunities, challenges and future directions of the ASEAN+3 financial cooperation. Panelists noted that since the East Asian financial crisis in the late 1990s, ASEAN+3 financial cooperation has deepened and expanded. They underscored that the Chiang Mai Initiative Multilateralisation (CMIM) has been further upgraded since 2014, with a crisis prevention facility and its size doubled to USD 240 billion, and AMRO has become an international organization since February 2016. “The commitment of ASEAN+3 economies to enhance regional financial cooperation has led to the establishment of AMRO, which is envisioned as an independent, credible and professional regional organization acting as a trusted policy advisor to members in the region,” said Dr. Chang. Panelists then examined the recent G20’s discussion on a more stable and resilient international financial architecture. Recently, the G20 leaders reconfirmed that they would support work to further strengthen the Global Financial Safety Net (GFSN), with the IMF at its center, and with more effective cooperation between the IMF and regional financing arrangements (RFAs). Panelists and participants all agreed that enhanced regional financial cooperation is in the interest of all members of the ASEAN+3 region and collective actions are essential for safeguarding the regional financial stability. They also concurred that CMIM and AMRO together would continue to serve as two main vehicles to mobilize the regional resources and consensus and to push forward regional financial cooperation agenda. They agreed that CMIM needs to be further developed and fully operationally ready and AMRO should strengthen its secretariat function to the CMIM and enhance its macroeconomic surveillance capacity to better monitor macroeconomic developments and detect risks. As an important initiative of AMRO, the ATFF will act as a flagship platform for ASEAN+3 Deputies, academics and high-level representatives of international financial institutions to brainstorm on challenges and issues relevant to the regional economic and financial cooperation.